Tucked behind the modern Seattle waterfront is the historic area of Pioneer Square. The most noticeable landmark is the triangle shaped park in the heart of Pioneer Square. Dominated by massive trees and a fancy iron pergola, a large carved wood totem pole almost blends into the surrounding foliage. The Totem pole was stolen from the Alaskan Tlingit Indians in 1899 by prominent members of the Seattle Chamber of Commerce. The thieves received a minor fine and the city was allowed to keep the pole. Until it was later set on fire by vandals. In 1938 the scorched pieces were returned to the rightful tribe owners in Alaska, who then carved a reproduction. 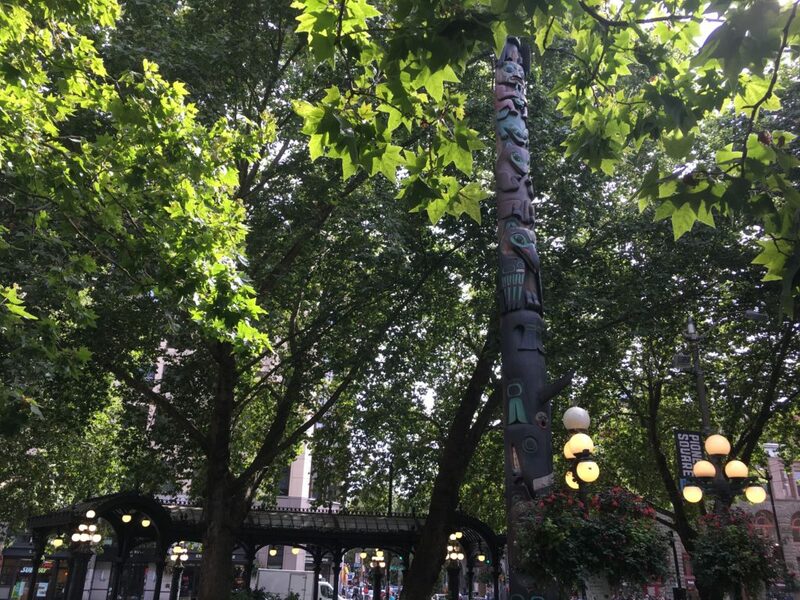 The reproduction totem pole is found in Pioneer Square today. The Victorian style Iron Pergola was built in 1909 for the local Cable Car Company. Owned and maintained by the Seattle Park Department, the structure is a National Historic Landmark. The pergola and Victorian style light posts are the first hint of the wonders hiding throughout the square. The stone and brick construction replaced wood as the material of choice after the Great Seattle fire of 1889 destroyed the previous wooden structures. A series of construction decisions included the addition of retaining walls and raising the street level, which created an underground for the previous ground floor entrances. This historic treasure was buried and forgotten for decades beneath the city streets. Rediscovered in the 1960’s, these preserved sections of the early settlements are quietly hidden underground and available for walking tours. 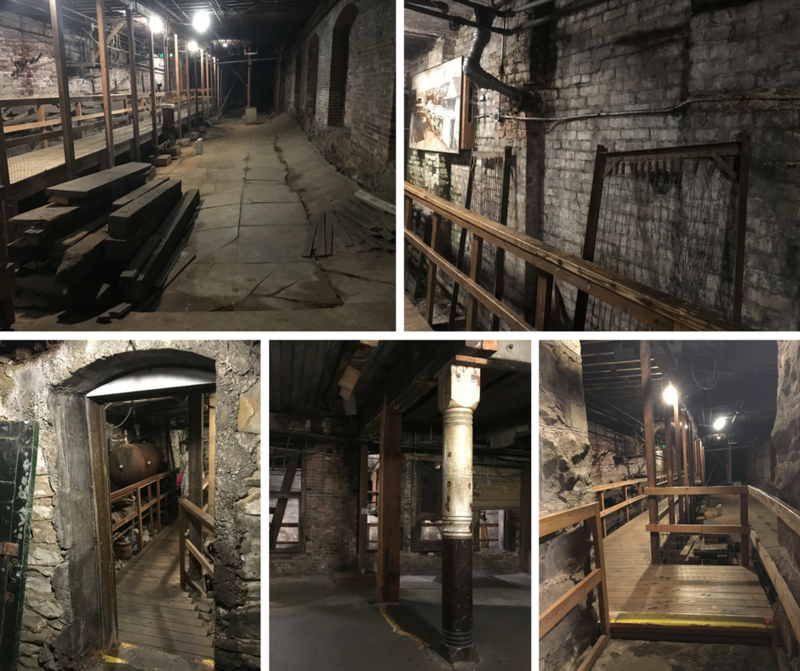 I prefer to explore areas on my own, and very rarely hire a tour operator, but the only way to access and explore the Pioneer Square underground now is via local tour company. The doors, gates, and access to the underground is through unmarked and locked doors around the historic square. Authorized guides are granted keys to unlock the hidden underground that waits below the modern world. On a whim (5 minutes of internet search), I found a top rated tour company with tours beginning in a few minutes. There were several tour companies to choose from and admittedly, I walked up to the counter of the first office that I found. The various tour operators provide multiple tour options for haunted history, private/small group, adults only, and tours in espanol (limited bilingual options). Each tour starts by descending the first of many stair cases. The tours are not wheelchair or stroller accessible and inappropriate for very young children (boring and difficult to carry or navigate the flights of stairs). Closed toe shoes are recommended for the uneven floors, wood staircases, and possibility of rats and other vermin hiding underground. My tour started underground with a seated 15 minute introduction on Seattle history filled with interesting facts and plenty of bad puns. The tour then includes crossing the modern streets, then back down. Each underground passage reveled a little more of the history of Seattle and their rival city Tacoma. 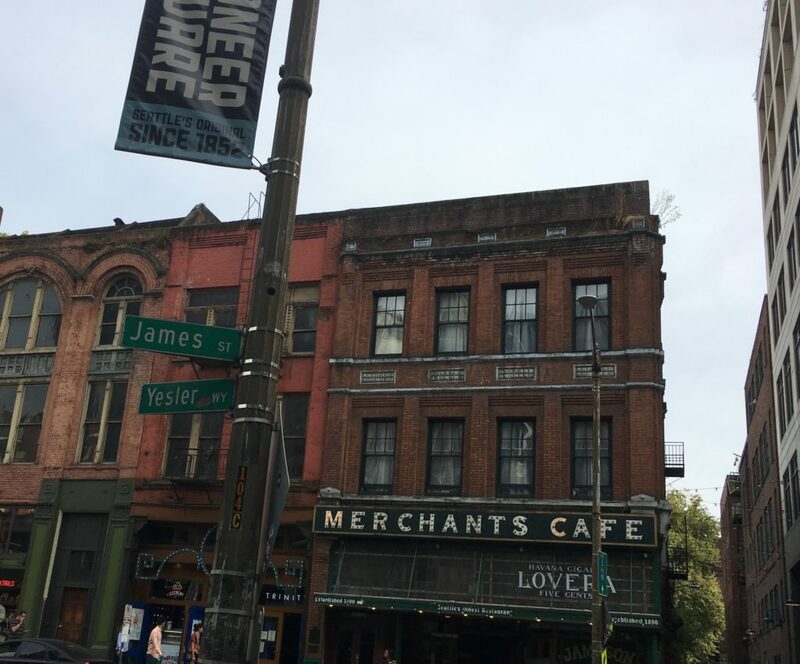 Our tour guide provided information on the history of the city including the shipping ports, role in the Klondike gold rush, the beginning of modern plumbing and sewage system in Pioneer Square, as well as the colorful personalities who shaped the town. One of the more interested tidbits is the history of the Seattle Sewing circle, the name given to the working prostitutes in the city. Many people came on the tour after seeing Anthony Bourdain’s episode of The Layover in Seattle. This would be an example of the adults only tour available. Overall, the tour was fun and informative. An ideal activity for grade school children (family friendly tour, obviously), and something that my retired parents would really enjoy. There were plenty of photo opportunities, and that rich musty smell of history. Of course, each tour ends at the gift shop. After exiting the gift shop, I retraced my steps above ground for a different perspective of the underground world below my feet. Due to my spontaneity, I apparently picked one of the busiest times for my tour, so it was quite crowded and a bit overpriced. There are plenty of discount tickets available on Groupon and other discount sites found, with a little planning there are smaller tours available at a lower price. 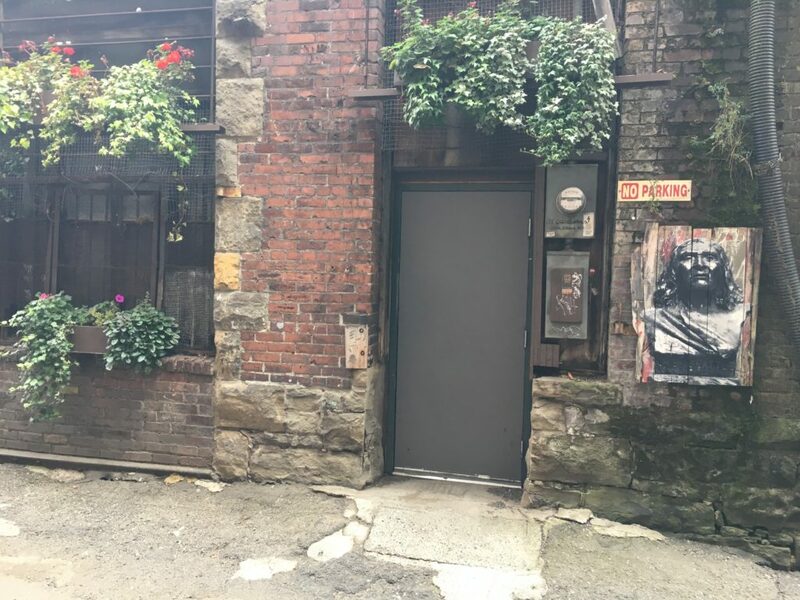 Pioneer Square is a must visit location in Seattle for history and architecture fans alike, and be sure to reserve a tour to explore the underground. 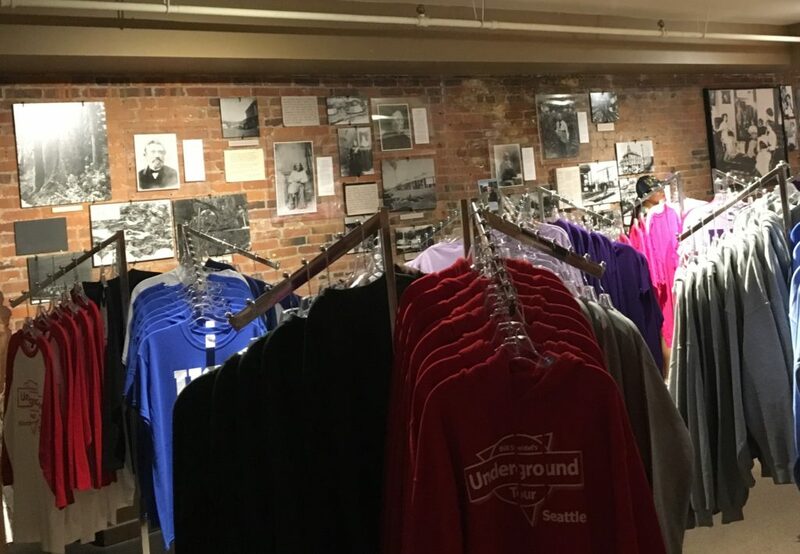 Have you explored the Seattle Underground? Rats are a risk, but we did not see any on our tour. Seattle’s underground Pioneer tour looks interesting for me as I have never seen these underground architecture previously. Though it must be dark and difficult to access but would love to see the history of Seattle. 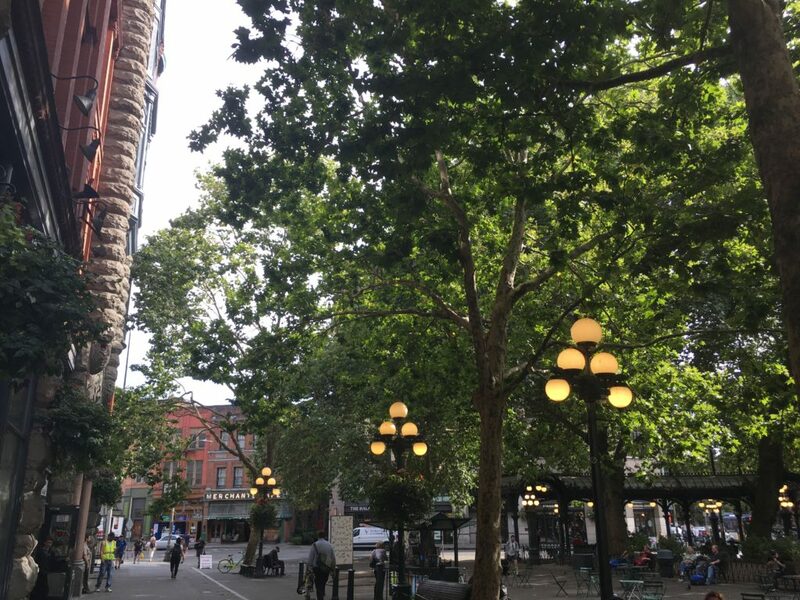 Park at Pioneer Square is also a nice place for chit chat or sitting out with a cup of coffee. This is a lovely insight into the other side of Seattle. I would like to embark on that tour myself. The Pioneer Square Underground is so interesting and a nice contrast to the beauty above! 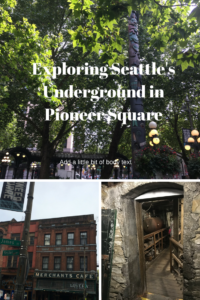 I’ve never heard of Pioneer Square but the underground tour sounds interesting (except for the possibility of encountering rats!). I had no idea Bourdain featured it. I must have missed that episode. I’m also intrigued by the fact that they called the prostitutes the Sewing Circle. I wonder why! Whenever a prostitute was arrested, she said her profession was seamstress. But there was no garment district in Seattle. That was just one of the many stories shared on the tour. I love tours like this, when you get to see something different than usual. I just hate that they always have to end in a tacky gift shop! It is like this every time! The gift shop was pretty comical. I just had to laugh at the end. I was literally just in Seattle yesterday and wish I had read your post one day earlier! I had no clue about Pioneer Square or Seattle’s underground system. Luckily I go to Seattle every summer so definitely adding this to the list for next time! I have been going to Seattle for YEARS and YEARs, and only found out about this last week. It is seriously one of the best kept secrets in the West! I’ve never even been to Seattle so I have to say no! It’s amazing to know Seattle has an underground like this, and I can only imagine the tales from what used to happen down there. Gift shops always tend to be overpriced; good tip about checking Groupon for a discount! It was such a weird and interesting experience!